Clarets boss Sean Dyche isn’t getting carried away after his side claimed a third-successive Premier League win for the first time. Burnley hit 22 points after 12 games as they eased past Swansea City 2-0 at Turf Moor to remain in seventh place, three points behind Chelsea in second, and seven clear of eighth place Brighton. 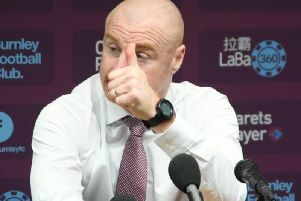 Dyche’s focus remains on hitting the 40-point mark, and anything beyond that is a bonus: “Don’t get me wrong, this is to be enjoyed, make no mistake, I’ll have my little window which will last about an hour, and then I’ll get on with planning for the next one. “But for the fans, the town, the players, the board, it’s to be enjoyed, these times, but it’s not a negative, it’s just to say, the reality is still out there, 40 points for us is a good marker - that’s your first marker, and anything that comes beyond that...that’s still the marker. “The next game is the most important, and the bigger picture, the 40 points. And he feels his side deserve to be where they are in the table, level on points with Liverpool and Arsenal, and one point behind Spurs: “I think we’ve had the odd scratch of luck along the way, but not much. We’ve earned the right to get the points we have on the board. The players have earned them. Jack Cork, signed in the summer from Swansea, and Ashley Barnes netted in the first half, and Dyche felt his side were deserved winners: “I think overall it was controlled rather than dominant, we had a good control of the game from an early stage, when it was an even affair for the first 15 minutes, and we scored a great goal. “From Popey to the other end, to score without them touching it, that’s not easy, and the quality within it. “Corky, what a couple of weeks he’s had, and he deserved his goal. It’s brilliant to see that, a detail of the game that isn’t as prevalent now, I love to see midfielders drive into the box. “It seems the days of Bryan Robson flying into the box and heading it in are not as often tense days, so that was great to see. “And then the second goal, a really good press, nicked it, simple but effective pass and a fantastic finish from Barnesy. “Then the control of the game was good, the organisation, and on another day, we had four or five counters and that’s our only bugbear, we could and should have killed the game off completely. Swansea has lost five of their previous six games, but he added: “They’re all difficult games, I know Swansea are having a tricky time of it, but they’ve still got quality, people who can affect the game, so we take everyone very, very seriously, we don’t think we’re at a level where we can’t. Chris Wood wasn’t in the 18 after featuring for New Zealand in their World Cup play-off defeat to Peru in Lima in the early hours of Thursday morning: “He came back, and had taken three flights to get back, and came straight from the airport to training...I don’t think that’s conducive to playing football. Forget about hamstrings. “He was never in my thinking once I found out the logistics.